Minerals play a critical role in our bodies and they have specific cofactors that help them to work properly so that everything we eat is perfectly assimilated. Mineral deficiency is quite common all over the world, in part because of modern-day living. Our soil has been depleted of minerals, resulting in fewer mineral-rich types of produce on supermarket shelves. Here are 18 common causes of mineral depletion. Magnesium is a vitally important mineral to good mental health. The lack is also one of the most common physical causes of depression. The lack of magnesium is also responsible for anxiety, agitation and even hallucinations. The other most well-known and important minerals needed to prevent (and sometimes treat) depression include calcium, zinc, iron, manganese and potassium. Each mineral has its own purpose. Magnesium supports bone mineralization, protein building, muscular contractions, nerve impulses, and boosts immunity. Calcium is responsible for the growth and health of bones and teeth and aids in blood clotting. Zinc produces genetic material and protein, transports vitamin A throughout the body, and is responsible for taste perception, wound healing, sperm production and normal fetal development. Iron is a part of hemoglobin, a protein which carries oxygen through the body's cells. Manganese facilitates cell responses, though it is the mineral scientists know the least about. It works with enzymes and is essential for many body functions, but how it is done remains somewhat misunderstood. Lastly, potassium maintains the body's fluid and electrolyte balance and helps with muscle contractions, cell health and nerve impulses. 1. 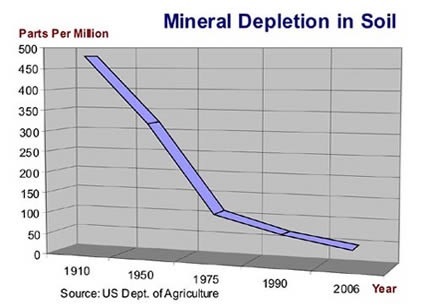 Soil Depletion -- This is the number one reason that most people are mineral deficient. Soil depletion has been well documented since the US Senate made their study back in 1936. Even organically grown vegetables are lacking in minerals -- organic farming only addresses the pesticide/chemical issues most typically. The best way to get mineral rich grown fruits and vegetables is through bio-dynamic produce, local CSA’s that practice crop rotation and soil supplementation through compost and other means, and of course growing your own garden you can work on the integrity of the soil. Not to mention, the animals we consume also need to be raised on good quality pastures with good soil conditions as well. 2. Antacids & Acid blockers -- deplete calcium, but often people are unaware as testing is done on blood levels and only 1% of the calcium in the body is in the blood. This doesn’t indicate the loss in the bones/tissues. Antacids/Acid Blockers contain aluminum hydroxide which prevents the absorption of calcium from the intestinal tract. 3. Low Stomach Acid/Hypochlorhydria -- the body needs appropriate stomach acid in order to break down minerals, namely calcium. Also, low stomach acid can be a sign of low zinc because zinc is needed in the body to help produce stomach acid. 4. Cortisone -- used for pain and inflammation can contribute to severe calcium loss with prolonged use. It also depletes potassium. 5. Pharmaceutical Drugs -- this is too vast to go into, suffice it to say all drugs deplete the body of a vast amount of nutrients. 6. Birth Control Pills -- deplete magnesium and zinc, along with numerous other vitamins. And since they have a direct impact on our hormones this also plays with our ability to get the minerals needed. They cause excess copper in the body, which can be toxic, this is why zinc becomes depleted as these two minerals are antagonistic to each other. 7. Coffee -- calcium/magnesium are lost in our urine with coffee. It’s a diuretic. You will be losing potassium and sodium as well. The same goes for caffeine in general. 8. Alcohol -- speeds up the excretion of magnesium through the kidneys. It can also deplete, calcium, zinc, iron, manganese, potassium and chromium. 9. Soda consumption -- contains excess phosphorous which leads to reduced body storage of calcium because they compete for absorption in the intestines. Soday also causes potassium loss. 10. Sugar- for every molecule of sugar our bodies use 54 molecules of magnesium to process it. Insulin surges use up our zinc. Sugar also depletes magnesium, potassium and robs your bones of minerals in general. A high sugar diet results in increased losses of chromium through the urine. 11. Excess Insulin- causes calcium to be retained by the body through re-absorption by the kidneys. 12. Excess Estrogen -- decreases calcium excretion. Same effects as birth control also apply. 14. The Standard American Diet (S.A.D diet) -- the typical diet of minimal fresh foods, higher amounts of refined and processed foods, foods grown on poor/depleted soils, excess phosphorous in these foods depletes calcium and has been shown to cause bone loss. Magnesium and chromium, (and all minerals really) are also lost in processing and due to poor soil. 15. Excess Grains- phytic acid binds with the minerals in the intestine and blocks absorption, causing them to be excreted unused. 16. Dietary Insufficiency -- source of food, how it’s prepared, is it processed or whole real natural foods. And of course, was the food raised properly on mineral rich soils. - Mercury -- amalgam fillings, in certain fish, vaccines. Blocks magnesium and zinc. Mercury binds with magnesium and renders it void. Supplementing won’t be enough, must detoxify the metals. - Aluminum -- Antacids/Anti-perspirants/Cosmetics -- aluminum foil -- aluminum penetrates the blood brain barrier and is very difficult to detoxify. Impedes the utilization of calcium/magnesium/phosphorous. Neutralizes pepsin. - Lead -- binds with calcium and makes it unusable for the body. 18. Radiation - any type of electromagnetic (EMF) frequency has an effect on the bodies ability to absorb and assimilate minerals. Exposure to EMF on a daily basis can reduce certain minerals in the body by almost 15%. The best way to ensure you are getting a wide array of minerals is by a whole foods, properly prepared nutrient dense diet. Understanding traditional foods and what our ancestors and indigenous tribes and cultures ate throughout history can really help us in our modern day peril of industrialized processed foods and depleted soils. It is critical in my opinion to learn how to make mineral rich bone broth and consume it regularly. This is one of the absolute best options and most absorbable forms available to us. Mineral rich salts are another great source. Our water used to be the best source, but nowadays our waters are so polluted that is not the best option anymore. Today's vegetables might be larger, but if you think that means they contain more nutrients, you'd be wrong. Donald R. Davis, a former research associate with the Biochemical Institute at the University of Texas, writes that jumbo-sized produce contains more "dry matter" than anything else, which dilutes mineral concentrations. In other words, when it comes to growing food, less is more. Scientific papers have cited one of the first reports of this effect, a 1981 study by W.M. Jarrell and R.B. Beverly in Advances in Agronomy, more than 180 times since its publication, "suggesting that the effect is widely regarded as common knowledge." Less studied, though, is the "genetic dillution effect," in which selective breeding to increase crop yield has led to declines in protein, amino acids, and as many as six minerals in one study of commercial broccoli grown in 1996 and '97 in South Carolina. Because nearly 90% of dry matter is carbohydrates, "when breeders select for high yield, they are, in effect, selecting mostly for high carbohydrate with no assurance that dozens of other nutrients and thousands of phytochemicals will all increase in proportion to yield." On the "Industrialization" of Agriculture: Thanks to the growing rise of chemical fertilizers and pesticides, modern crops are being harvested faster than ever before. But quick and early harvests mean the produce has less time to absorb nutrients either from synthesis or the soil, and minerals like potassium (the "K" in N-P-K fertilizers) often interfere with a plant's ability to take up nutrients. Monoculture farming practices - another hallmark of the Big Ag industry - have also led to soil-mineral depletion, which, in turn, affects the nutrient content of crops. The excessive use of resources, industrial development, erosion, irrigation, drainage of wetlands, deforestation and mining for oil and minerals are other broader perspectives on why mineral depletion exists. Addressing these problems will be one of the biggest challenges for humanity in the next few decades. Listed below are links to blogs that reference this entry: 18 Causes of Mineral Depletion. This page contains a single entry by Toni published on September 10, 2012 5:52 PM. Nutrients May Reduce the Risk of Having a Child with Autism was the previous entry in this blog. New Study Finds Link Between Flu Shot, H1N1 Pandemic is the next entry in this blog.